"I'm a Mother Ain't I?" There's a story that my father loves to tell of a time that he walked past my bedroom and found me with my stuffed animals all lined up in front of me. I had recently watched a TV show about Sojourner Truth, the courageous female slave-turned-activist preacher who fought for the rights of slaves and women, and who is most well-known for the speech in which she coined the phrase "Ain't I a Woman?" I was too young to interpret her words as a speech against racial inequality. But I emulated her in my own three-year-old way. When my father happened upon me extemporaneously lecturing my dolls, I was reportedly saying, "and I'm a Mother, ain't I?" (to be exact...I said: "I's a mudder, ain't I?" ) To me, "woman" and "mother" were one and the same. Again and again, I rambled on and repeated that phrase, "I'm a mother, ain't I?". It must've been quite humorous for my dad to see me, at this young age, with such a fire in my soul. I still admire Sojourner Truth, and I still feel that passion when it comes to being a mother. My own mother was fiery that way. She was my role model and my inspiration. What I remember most about my mom was the hours she spent sewing clothes for us. She cooked dinner for us every night, and this was also proof to me of her great love for us. When I was so busy during high school that I practically lived at school, I remember her bringing me dinner in a brown paper bag. This was particularly touching to me, and unexpected. Scarlett and Guy came home from preschool today with Mother's Day presents for me. This pasta-covered tissue box is my proof that I am indeed finally "a mother, ain't I?" And you know what? It feels every bit as good as I thought it would. I will be back on Sunday with the winner of our Mother's Day Giveaway! The homemade gifts are always the sweetest. Happy Mother's Day! I made a pasta covered paper plate spray painted gold as a child, it was my prized possession for years and years. I never gave it to my mom, so you must be a super great mom to receive such a treasure! What a cute gift, and I love the little verse, too! I love the idea that in your mind, mother and woman were synonymous -- reminds we of Sheri Dew's talk. I see that in my 5 y/o who mothers her younger sister and in the sweet little babysitter who loves our children when Doc and I are gone -- these mothers in training were born with the seed of motherhood in them. Happy Mother's Day! Make sure to read Allison's wonderful guest post from Monday -- it's a tear jerker (of course - she's amazing). you're a special mother...yes you are. 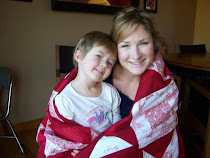 I think there is something very empowering in reminding ourselves that we are mothers- what a blessing! What a privilege! What an opportunity! Happy mother's day! i love it! happy mother's day. As usual I enjoyed your post. Blessings to you and have a very Happy Mother's Day! Oh, what a wonderful story and yes you are a mudder!! You go girl! !